MarketSaw - 3D Movies, Gaming and Technology: Exclusive: Press Conference TODAY With "The Dwarves" Of THE HOBBIT!! 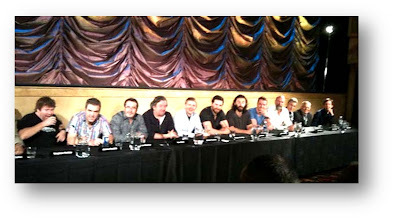 Exclusive: Press Conference TODAY With "The Dwarves" Of THE HOBBIT!! **AND now a video of the conference! EXCLUSIVE: I have heard from one of my top sources on THE HOBBIT mere minutes ago and he says later today (Friday, New Zealand time) there will be a press conference with "The dwarves" in attendance!! Wish I was there. The content of the conference is so hush-hush that even he doesn't know what will transpire. Further casting announcements perhaps? What we DO know is that shooting will commence on March 21. Hopefully Peter Jackson will be back up to par (or better) by then!